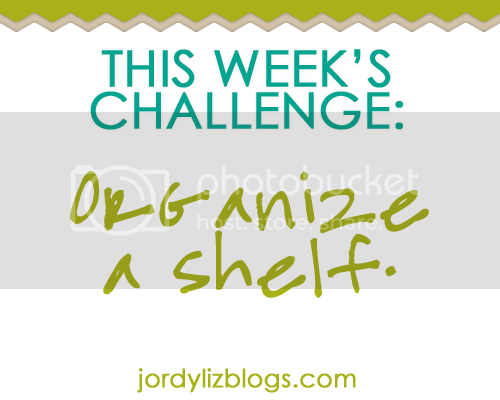 Jordy Liz Blogs: Organizing Life: A shelf. This week, I organized a shelf. I took on the bookshelf in our guest room. It's full of all my books collected from years and years and years. I read a book, put it on the shelf, and then never read it again. Yet, I keep it. I buy a book, intend to read it, put it on the shelf, and then don't get around to it. After many, many moves with heavy boxes of books, I was tired of hanging on to books I didn't need. So, I did my best to streamline it. One of the reasons I hang on to books is because of the words. I underline and highlights word that are meaningful to me. To help streamline this, I started a Google Doc that lists the book's title, author, quote, character and page number. I now have a library of quotes at my fingertips without the bulkiness of the books. I decided to organize it in a way that would help me stay accountable to books I need to read and created one of the shelves to be my "to read" shelf. I typically like to keep all my faith-based books as references and books to pass along. To keep a list of books I've read and books I want to read, I scanned all of my books into my GoodReads app with their handy barcode scanner. I also took out all of the books I no longer wanted. I plan on selling these back on Amazon or passing them along to friends. Looks great!! I love the idea of having a "to read" shelf... And I especially love how you've used technology to get organized. As a teacher, I definitely need to get my book collection organized - especially I'm my classroom! I didn't know about the GoodReads barcode scanner - I'm going to need to look into that. Thanks for the ideas! I love the background of your bookshelf! I will have to share the idea of having a "to read" shelf with my oldest son as his bookcase could stand some organizing. Thanks! I got it Ikea a few years back. GoodReads is great and so easy! I love selling my books on Amazon. It's the best.